There’s a story to be told and I don’t have much of the text. In fact, Con would most likely have approved. At one time he felt that climbing west and north of the Great Glen should not be recorded and that large tract of mountainous country, be left for exploration only, with nothing recorded in print. He helped me with the fourth edition of ‘Winter Climbs – Ben Nevis & Glencoe’, but preferred not to be acknowledged. There will be many of those reading this obituary, who can fill in some of the big gaps that I’m left with. Cunningham, Geddes, Docherty, MacIntyre, Chambers are no longer with us. They all climbed with Con. To me, and many others, he was always encouraging and helpful. Nicolson and ‘Skip’ are amongst those who agree that Con was “one of the good guys”. 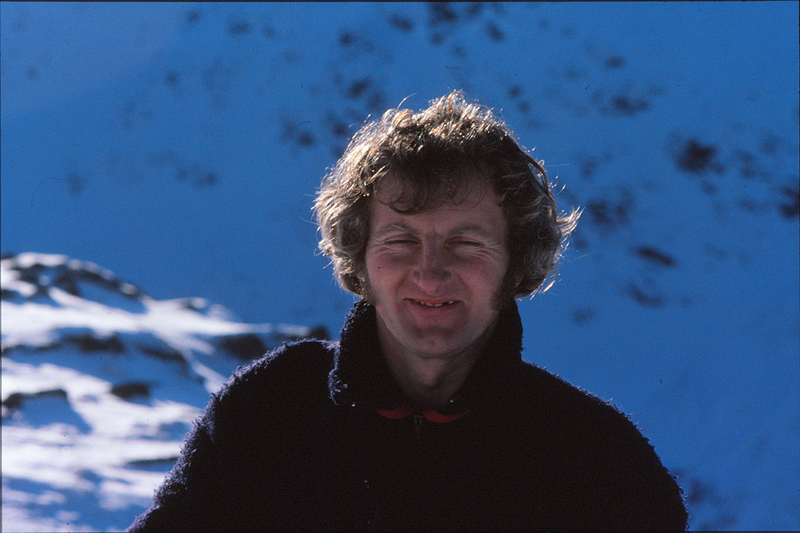 Arriving in Fort William in 1971 I discovered an active winter climbing scene, that included Con and other members of the Creagh Dhu mountaineering club. Some had work, some not. They all had a passion for the mountains. Even on marginal weather days, Con and the team would go up…. “for a look”…. This attitude of ….“if you don’t go, you’ll not know”…., produced a good clutch of new climbs on Ben Nevis. I went into Carnmore in the winter with another pal and Con, but nothing doing, so we walked out again. Competition for new ground was intense, especially between east and west and the SMC and Creagh Dhu. The poor winter of 1973 only produced three new climbs. Boomer’s Requiem, by Con Higgins and Dougie MacArthur being one of them. The crux pitch is fierce and much steeper than anything on Point Five Gully. Who was Boomer, by the way? Con often turned up with axes he had made himself. He was a brass fitter by trade with an engineering background. A variety of shapes and axe sizes, at a time when anyone with a knowledge of metalwork was experimenting, from Clydeside to California. We all have a lot to thank these fertile minds, when clinging on to modern tools. Climbing with Con on Ben Nevis was always interesting, challenging, hard and successful. At the start of every day, heading towards a new climb I knew very little of the destination. Meeting and climbing with Con improved my ice climbing ability dramatically, at a time when lower grades were all I had in the bag. It was a natural progression and Con showed me what was possible on winter climbs. The social scene enhanced days out. In particular, a small flat above the West Highland Museum, where the curator was friendly with one of the crowd! Drunken nights in the back bar of the Kingshouse. Performing involuntary 360deg skids on an icy A82 in Glencoe, on the way home to Fort William. A trip home, using the Ballachulish ferry, before the bridge was built, when one member of the party, dived over the side and swam the rest of the way. He asked for a refund on the other side. Some Creagh Dhu members were present and very encouraging of these aquatic efforts. Climbing by comparison was a lot safer. Mountains were the common gel that joined us all. It’s on the mountains of Scotland and particularly Ben Nevis, where Con Higgins left us a fine legacy of great climbs. To me and many others, Con Higgins was a good and trusted companion on the rope. He’s at rest now and I’m thankful for that, as well as being able to share in a small part of his life. 12:30, Friday 13th, April 2018.